A review by SPPI and CO2 Science finds the CO2-fertilization induced percentage increase in plant productivity was nearly always greater under water-stressed conditions than it was when plants were well-watered. 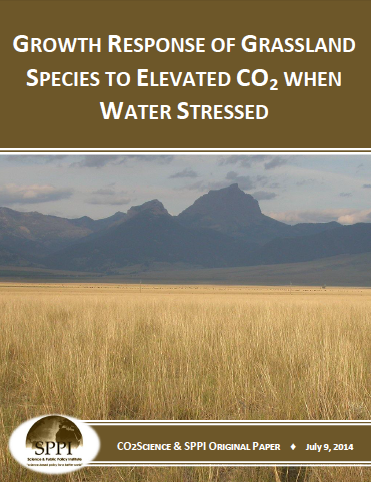 As the air's CO2 content continues to rise, nearly all of earth's plants should exhibit increases in photosynthesis and biomass production; but climate alarmists periodically claim that water stress will negate these benefits. In reviewing the scientific literature of the ten-year period 1983-1994, however, Idso and Idso (1994) concluded that water stress will not negate the CO2-induced stimulation of plant productivity. In fact, they discovered that the CO2-induced percentage increase in plant productivity was nearly always greater under water-stressed conditions than it was when plants were well-watered. And seven years later, Poorter and Perez-Soba (2001)conducted a similar literature review and came to the same conclusion. In this summary, therefore, we provide some background for this phenomenon and highlight some of the most impressive work that has subsequently been done in this area.